April grew up in Connecticut and always knew that she wanted to work with animals. She started shadowing a local veterinarian at a young age and eventually went to an agricultural high school where she studied veterinary science. When April started looking for colleges, she learned about veterinary technicians and loved the idea of providing nursing care for animals. April attended Mount Ida College in Newton, MA and graduated in May 2014 with a Bachelor of Science in Veterinary Technology. April recently took her VTNE exam and she is now a Certified Veterinary Technologist (CVT). When she was a sophomore in college, April moved off campus into an apartment and naturally wasted no time adopting a dog. April drove the long 20-hour-roundtrip drive from Connecticut to southern Virgina to adopt a 10-week-old Australian Shepherd mix puppy. 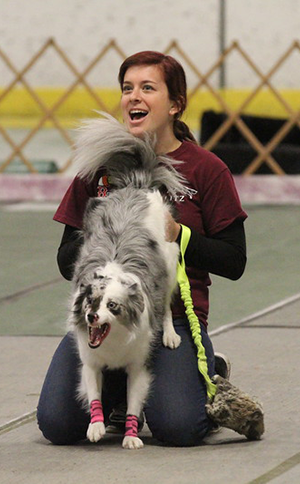 She had always wanted an Aussie and expected to maybe do some obedience and agility trialing. April never thought she would get such a talented, driven, and biddable companion. April named her Sarafina, which is Hebrew for “little fiery one”, a name she surely stands up to. As a puppy Sarafina excelled in her obedience training with April and she quickly enrolled her in advanced obedience and foundational agility classes. She excelled in both classes and was always quick to learn a new command. When April moved back to Massachusetts after being home in Connecticut for the summer, she began looking for agility clubs that we could join. Somehow that search brought her to flyball clubs. April had never really seen much flyball, but Sarafina loved her ball and her tug so she figured they would try it out. It didn’t take April very long to realize that they had found Sarafina’s calling! Within 4 short months, Sarafina was running full-time at tournaments and loving every second of it. In only a year and a half of racing she had gotten 9 flyball titles including: FD, FDX, FDCh, FDCh-S, FDCh-G, FM, TF, TF-I, and TF-II. Sarafina’s PB time 3.9 seconds. 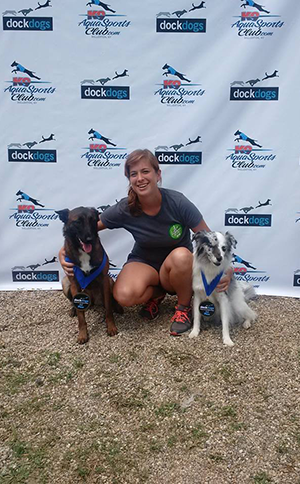 Since then April and Sarafina have competed in a vast array of sports including disc, dock diving, lure coursing, herding, and agility. Sarafina has her Junior Jumper title from DockDogs and will be competed at the 2014 and 2015 North Eastern Regional Championship and was invited to World Championships two years in a row. Sarafina also has her Coursing Ability (CA) title and will begin trialing in agility this fall. Milk Thistle is a great to use to cleanse her liver after receiving vaccinations, medications, or being exposed to stressful situations such as competitions. By using Herbsmith’s Milk Thistle I am confident that I am protecting Sarafina’s liver. Being a canine athlete can be tough on a dog’s joints. Herbsmith’s Sound Dog Viscosity Powder ensures that Sarafina’s joints can handle the demands of competing. Herbsmith’s Sound Dog Viscosity Powder goes beyond traditional joint supplements by adding herbs that support joint, bone, and soft tissue health. Healthy joints are key to having a happy and athletic dog, even if they don’t compete in sports. Last but not least our favorite product is Herbsmith’s Athlete. Athlete is an amazing product that helps your dog maintain a healthy hydration level when competing. This allows for competing athlete dogs to be able to perform to their fullest and maintain their endurance throughout the day. I have seen a great change in Sarafina’s endurance level since using Athlete. She is able to run harder for longer without wearing out.